If you are responding to this item that appeared in the Letters section of the Cleveland Jewish News, please click here to learn how to share Glenville memories. Cleveland's Jewish community, from its beginnings downtown in the 1830's, has been on the east side of the Cuyahoga River and has been steadily moving east. In the period 1870-1910 most of the Jewish community lived on Woodland and Central Avenues and nearby streets, from near downtown to the East 40s, then farther east, past East 55th where many Jewish institutions would be built. After World War I Jews and our communal institutions moved eastward again. The exodus from the Woodland area was very rapid. In ten years its Jewish population fell from 35,000 to only 1,400. Some affluent families bought homes in the Heights or Bratenahl, but most Jews moved northeast to Glenville and the rest moved east to Mount Pleasant - Kinsman. In the 1930s the Glenville neighborhood was home to more than half of Jewish Cleveland. In the 40's the great migration from city to suburbs began. It was accelerated by a growing black population, drawn to Cleveland for jobs and greater freedom. With their choices limited by the real estate and rental practices of the time, they surged into Glenville. The African American proportion of Glenville residents soared from only eight percent in 1930 to 90 percent in 1950. The pattern in Glenville was being repeated in almost every major American city. This was the time when words such as "blockbusting" and "white flight" were first used. By 1960, Glenville High School, whose Jewish enrollment had once been as high as 90 percent, had no Jewish students. Glenville's years as a vibrant Jewish neighborhood had ended. Note: most of this section was drawn from the Jews & Judaism and Glenville pages in the Encyclopedia of Cleveland History. 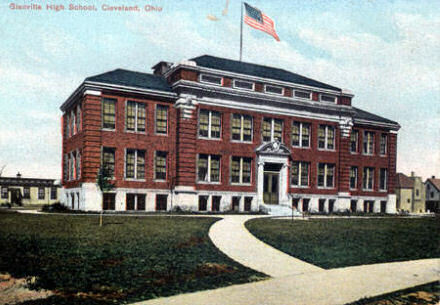 Built in 1919. Closed in 1966 when a new building opened. Look for pages with images and text submitted by former Glenville residents and perhaps their children. To learn how to participate, click here. With the help of Nate Arnold, who leads tours of old Jewish Cleveland, we have photos of some of Glenville's major Jewish institutions on this website. See Cleveland's Synagogues. In the Encyclopedia of Cleveland History. The Wikipedia article. Includes a list of notable graduates. For more notable citizens click here. A neighborhood tour, on the website of CSU's Neighborhood Links. We show the full story as it appeared in the Cleveland Plain Dealer, September 26, 2006, and have added many photos, with captions furnished by Lou Gordon.